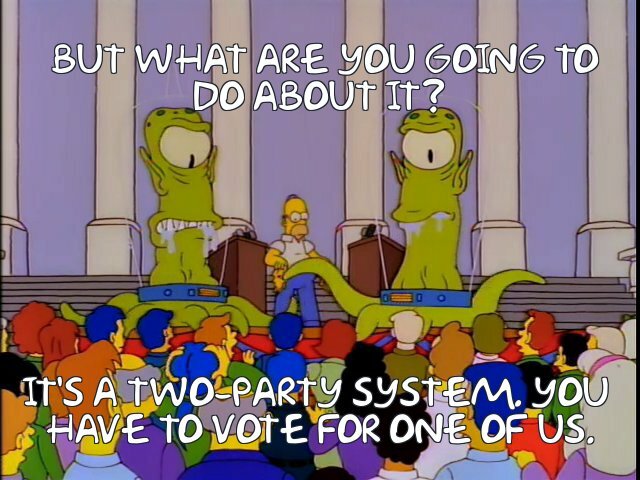 The duopoly has us right where they want us; the cost savings of AI; hooking kids early on voice technology; bitcoin is the greatest scam in history; the future of content marketing and where customer experience is headed; why influencer marketing fails; what's behind flagging corporate reputations; Amazon's Prime directive; earnings for the tech giants are all rosy; Netflix wants to get into the theater business; MoviePass may not survive; streaming music companies like the revenue streams; don't get too personal with personalization efforts; what you need to know about GDPR; books, books and more books; the podcast of the week and more in Weathering the Storm edition of The Full Monty from Brain+Trust Partners for the week of April 30, 2018. Last week we experimented with a partial feed, requiring you to click through from the email to the web page. We had mixed results and we're returning to a full feed. Please let us know if you have any additional feedback about it, or feel strongly one way or the other. Amid all of the recent uproar of data privacy issues among a number of companies, the outrage did nothing to stop the forward motion of Big Tech. Timing, incentives, and lack of competition all play a part in explaining this unstoppable force. When Facebook and Alphabet (among others) reported their Q1 earnings last week, investors cheered. Facebook beat Wall Street estimates of $11.41 billion by reporting $11.97 billion in revenue, and $1.69 earnings-per-share, compared to the $1.35 estimate. Google's parent company Alphabet also outperformed with revenue of $31.15 billion versus the expected $30.29 billion, and an EPS of $13.33, compared to the estimate of $9.28. Solid performance for an industry that was under fire for privacy and data issues. Timing may be a factor. With Facebook getting called out more than halfway through the quarter, and Mark Zuckerberg making his appearance before Congress in the final weeks of the quarter, there was little time for advertisers to make any drastic changes to their advertising spend. We should keep an eye on how they perform in the next quarter, as we'll be able to see if there's truly been an impact. We anticipate a very small blip in Q2 as things begin to normalize, but it won't stop these juggernauts. One of the other reasons is that financial markets have given Facebook no incentive to care about users’ privacy. As we saw this quarter and have witnessed in many previous quarters, investors continue to reward Big Tech companies whose business models rely on targeted advertising. To investors, these companies are seen as innovators in what is becoming known as surveillance capitalism. In the ad tech business model, it's business first, users second. Not to mention that there really aren't any alternatives to advertising on Facebook and Google (although Amazon is making a go of it). The duopoly accounts for 63 percent of US digital advertising revenue, and given than they control so much traffic and attention, it's difficult for advertisers to go elsewhere. Combine that with the coming GDPR regulations in Europe that will require brands to ask for permission for users' data, and Facebook and Google may even strengthen their positions. The 2018 Corporate Accountability Index evaluated the 22 most powerful tech companies on their disclosed commitments and policies affecting freedom of expression and privacy. Many are falling short, having made meager progress over last year. That may change with GDPR, but there doesn't seem to be a solid push for this across the industry. So it's clear that brands need to step up and own and control their own data, which of course means that they'll have a more direct relationship with customers. There's only one issue with that: brands have spent the last decade or more outsourcing their digital and social efforts to platforms and agencies to do the work on their behalf. The results? Brands simply aren't ready for modern-day marketing. The economics of AI are fascinating. Five imperatives for harnessing the power of low-cost prediction. Google's co-founder Sergei Brin has thoughts about the threat of AI in today's technology renaissance and is even giving thought to the future of job destruction/creation. Amazon launched a $79 Echo Dot Kids Edition with kid-friendly Alexa and one year of FreeTime Unlimited, a bundle of curated content with a Parent Dashboard. This is how you hook them early. Also? It rewards kids who say please and thank you. Amazon is creating a home robot. 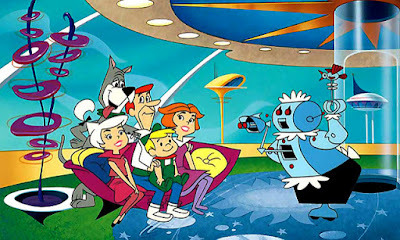 Don't look now, but we're about to become The Jetsons. The advent of GDPR may drive blockchain usage for content. Experts think it can help build trust and transparency in the digital economy, in keeping with the spirit of GDPR. Trying to keep up on the latest bitcoin craze? Don't bother. 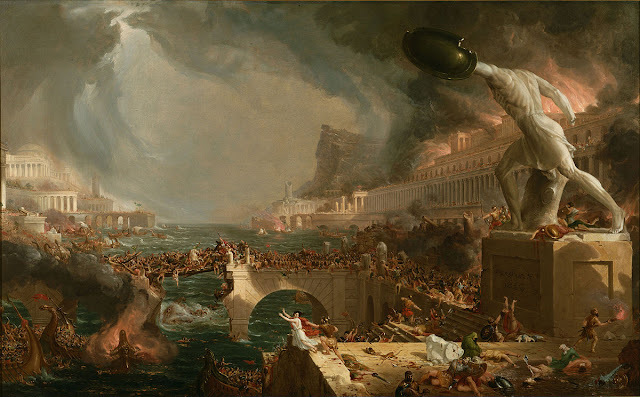 Bitcoin is the greatest scam in history – a colossal pump-and-dump scheme. Ford Motor Company shocked the industry last week, saying that it is discontinuing every passenger car except the Mustang and Focus Active, instead putting its energy into trucks and utilities, backed by flexible platforms and electrified drivetrains. A bold and perhaps even controversial move, but one that will give the company more profits to put toward autonomous and electric vehicles. The Chinese ride-hailing giant Didi is preparing for an IPO. Quicker than Uber. Now there's a real-life Transformer that you can ride in. More than meets the eye. A discussion about what the future of content marketing looks like. As Facebook falters, news aggregators like Flipboard make a comeback. You can follow links throughout the week as we flip them into The Full Monty. Aristotle knew what marketers don't: why influencer marketing fails. 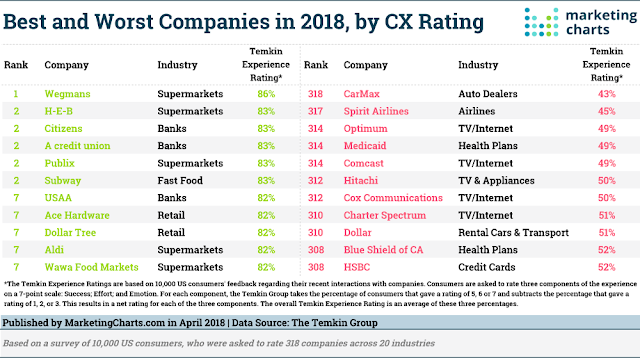 A look at the state of customer experience and where it's headed. US corporate reputations are in decline. The Reputation Institute attributes these declines to a growing belief that companies focus on profits over people. In other words, lack of authenticity. Or perhaps they're simply being transparent about their priorities. We're in an age of information overload. That doesn't mean that we can't be more well-informed about our messaging. One way to forge ahead is to simply look at human behavior as a guide. Having a creative brand personality can boost your PR efforts. Walmart is merging its British unit Asda with competitor Sainsbury in a $70 billion deal. Walmart will retain a 42 percent stake in the new entity as it moves toward more joint ventures in competitive markets to more effectively compete with other online retailers. Amazon is raising the price of Prime from $99 to $119. Given their recent announcement that there are 100 million Prime members, that's an additional $2 billion to Amazon. And let's face it: it's not going to stop you from paying the additional cost, is it? PetSmart was the most expensive takeover in retail. And now it's drowning it debt. Once again, watch for a major retailer to suffer because of an LBO (ref. Toys 'R Us, Payless, Gymboree, etc.). Don't want your packages stolen off of your porch? No problem. Amazon will deliver packages to your trunk. Now you can risk theft of your car instead. And Walmart is partnering with DoorDash for delivery, in addition to previous relationships with Uber, Lyft, Postmates, and Deliv for the last mile. But don't count on Walmart and Instacart working together. The sticking point: Walmart wants to use Instacart for delivery, while Instacart wants people to fulfill orders through its app. Twitter reported earnings and performance last week, and Wall Street was thrilled. The company reported profits of 16 cents per share on revenue of $665 million for the quarter, including a profit of $61 million. And they added six million new users. Twitter is making good on its pledge to fight the persistent problems of spam, bots, harassment and misinformation that have plagued the social platform for years, revoking access for 142,000 apps covering 130 million tweets in one week. As reported above, Facebook beat Wall Street estimates of $11.41 billion by reporting $11.97 billion in revenue, and $1.69 earnings-per-share, compared to the $1.35 estimate. User growth was up 3.42 percent compared with only 2.15 percent last quarter. Perhaps most impressive of all: 91 percent of the advertising revenue was from mobile ads. Facebook published the internal guidelines it uses to make tough decisions on sensitive topics on its platform, including hate speech, child safety and terrorism. Instagram Stories now allows users to upload multiple photos and videos at once. Alphabet outperformed Wall Street with revenue of $31.15 billion in Q1 versus the expected $30.29 billion, and an EPS of $13.33, compared to the estimate of $9.28. The new Gmail redesign is here, with lots of increased functionality. Snap announced Snappables, AR lenses that use touch, motion, and facial expressions for single and multiplayer games, rolling out globally with new games weekly. Snapchat redesigned its redesign. The stock reacted accordingly. Digg was bought by a company called BuySellAds. Goodbye, Digg. It was nice knowing you. Flipboard launched a new Technology section. It should appeal to you if you read this newsletter regularly. Netflix wants to get into the movie theater business. Given their success with original content, it's not a stretch. But it may erode their profitability and core focus as they become more like a typical studio. Then again, they have a secret sauce, and this move is akin to Amazon getting into brick and mortar stores. Neflix-loving kids are killing cable. As it prepares for an entry into streaming video, Disney could be a worthy foe to Netflix and Amazon. E-sports viewership is now larger than NFL viewership. That's right: more people are watching people play video games than are watching people play football. MoviePass has changed its terms from $9.95 for one movie per day to four movies per month. Some question whether MoviePass will even survive. Spotify announced a new version of its free app, reflecting the company’s belief that creating a better user experience for unpaid subscribers will result in more paid subscribers. Google Play Music will be replaced by YouTube's upcoming music streaming service, with Play Music users forced to use the new service by the end of 2018. Apple Podcasts topped 50 billion all-time downloads and streams. What's more impressive is that in 2017, it notched 13.7 billion episode downloads and streams. That's quite a jump. Revenues are surging for streaming music providers. Program of the Week: Our pick this week is The Moment with Brian Koppelman. Interviews about the pivotal moments that fueled fascinating creative careers. I've every interview to be fascinating, and I think you will too. Thanks to Collin Kromke for the suggestion. Do you have a program to recommend? Add yours to our Google Sheet: smonty.co/yourpodcasts. Consumers want personalization, but they don't want it to get too personal. Hackers are finding ways to break into hotel rooms that don't involve your key or carelessness. As hotel companies move customers to mobile phone-based keys, even if one guest uses a keycard and discards it – and even cards as five years old – may result in potential hacking. Why we should worry about Google and Facebook owning our data. As the deadline in Europe looms, here's what you need to know about GDPR. Scott Brinker is @chiefmartec and he produces an annual graphic that contains all of the marketing technology companies. Last year, it was 5,000. This year? Nearly 7,000 companies make up the Marketing Technology Landscape. At this rate, it feels like consolidation is coming. If you want to get better at deep learning, then you need to practice. The good news is that Analytics Vidhya has put together 25 open datasets for deep learning that every data scientist must work with. What one job skill is most lacking in the US? LinkedIn CEO Jeff Weiner has the answer. And it's part of our of our sections above. Art in the Instagram era involves much less real-time admiration, as you might guess. Westworld is back for a second season on HBO. And if you like Westworld, you'll like these 10 books. And if that's not enough, The Great American Read from PBS brings you America's 100 most-loved books. If you want to succeed in writing, use a masculine name. In a groundbreaking study of more than two million books published in North America between 2002 and 2012, scholars found that books by women authors are priced 45% less than those of their male counterparts. 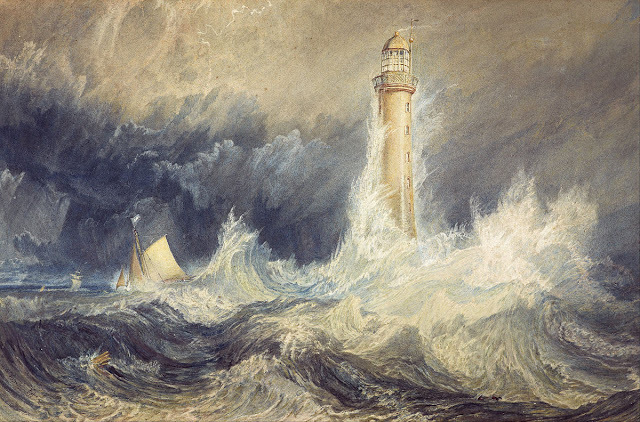 Looking for a translator who understands legalese; the robot resistance may be rising; Amazon's algorithm will help you look cool; predictive business intelligence systems are the future; Tesla should learn from history; the best digital and social media research of 2018; tech matters to grocers and Home Depot; YouTube TV gets digital-only networks; the lights are on at Flickr; Netflix is going strong - but for how long? ; the Podcast Consumer 2018 from Edison Research; fake reviews are big business; measuring innovation; why solvitur ambulando may be your answer; revealing our image strategy; the podcast of the week and more in Our Terms of Service Have Changed edition of The Full Monty from Brain+Trust Partners for the week of April 23, 2018. The more eagle-eyed of you may have noticed the progression of images over the last five issues of the newsletter. It's a subtle nod to Alfred Hitchcock, who famously made cameo appearances in nearly every movie he directed. It took him six years and three films to pull off his cleverest gag: in Spellbound (1945) , he was seen carrying a violin case; in The Paradine Case (1947), he had a cello case; and in Strangers on a Train (1951), he struggled to bring a double bass onto the train. 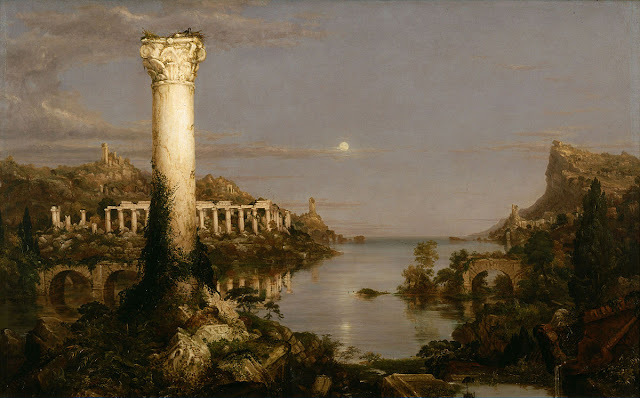 Our version was the five-part series The Course of Empire by Thomas Cole. The Facebook / Cambridge Analytica news has brought quite a bit of the unrealized or unspoken of the tech world into national consciousness. Collectively (and individually in some cases), we've been talking about data, privacy, and what we're willing to give up for our beloved free services. But it strikes us that there's an element that's been with us all along which could have saved us from ourselves — a functional piece of each and every app and service that we use that should have been a talisman, but was instead a nuisance at best or an impediment at worst. We're of course referring to the Terms and Conditions. Ts and Cs (or ToS for "Terms of Service" on some platforms) are what we're typically greeted with when we sign up for new apps, platforms and services. Before you can dive in and share your photos from last night's party, your political opinion on the hypocritical politician of your choice, or message someone, you need to make your way through the legalese of the 20-thumb scroll to find the "I Accept" button that you press, having read none of the Terms. And is it any surprise that you haven't read them? With some of them <cough>PayPal</cough> being longer than Hamlet, who has time to read them in their entirety? This is how some Londoners were tricked into signing over their firstborn children. With this kind of easy slip-up, simplification is needed. The real function of these dense, jargon-filled policies and agreements — which most of us universally ignore — isn't for companies to inform users of our rights, but to establish legal grounds for collecting and sharing our information. That's it. Plain and simple. It's a way to ensure that business models stand because we're too lazy or stupid to read and understand the terms. But now, thanks in part to the advent of GDPR, meant to return control of personal data to the individual by ensuring companies follow a new set of data protection compliance rules, companies are scaling back and simplifying their terms of service. Why? Because users' consent would be legally invalid if they don't understand the agreement they're signing. But you might ask: if they can simplify to adhere to regulations, why couldn't they have simplified for the sake of customers in the first place? To which we'd answer: see the above paragraph. Facebook is no exception, and the company initially said that it would adhere to GDPR standards around the world – not only in Europe. However, the company quickly changed its position to mean only in Europe, meaning that the other 1.5 billion Facebook users around the world would be governed by the looser US standards. US regulators have an opportunity to step up and create the same level of data protection for Americans that have been created in Europe. Certainly, multinational companies will need to create a single standard that complies with GDPR. Facebook should step up and meet this need before regulation is required. Then again, seeing that a number of elderly members of Congress recently had difficulty in understanding basic Internet and social media terms and functions, perhaps we should ask them to spend time reading the Terms and Conditions of their own jobs. The anti-robot uprising is coming: "Automation anxiety" is likely to trigger popular resistance to robotization, says Carl Frey, leading researcher on the future of work. Now wait just a minute: the artificial intelligence revolution hasn't happened yet. We have much to learn, and practical applications are just taking seed. Marketers, content creators and other creatives can take a page from machine learning marketing algorithms, lest they be replaced. Amazon’s Echo Look allows you to take hands-free selfies and evaluate your fashion choices. Business intelligence systems, largely the domain for analyzing past performance, are being retrofitted with artificial intelligence to bring predictive features to their reporting capabilities. Automotive experts say that Tesla is repeating the mistakes of the auto industry from the 1980s. Elon Musk is discovering that large-scale car manufacturing is really hard, and it's not easy to improve on the methods of conventional automakers. In this age of information overload, your digital messaging doesn't need more data; sometimes you just need to understand the basic human processes that govern decision-making. All of the best digital and social media research in 2018, compiled by Journalist's Research. Three ways a creative brand personality helps to boost PR efforts. Apple plans to integrate recently acquired magazine app Texture into Apple News and debut its own premium news subscription service next year. The biggest news in retail last week was Amazon revealing that it has 100 million Prime subscribers. Amazon's next retail conquest: apparel. Note the article in the Aʀᴛɪꜰɪᴄɪᴀʟ Iɴᴛᴇʟʟɪɢᴇɴᴄᴇ section above: this is a key component to Echo Look. Home Depot is launching its biggest tech hiring spree ever to protect its lead over Amazon. Tech is a priority for grocers. Omnichannel initiatives are seeing greater adoption in supermarkets, and more are fully integrated than last year. Nearly every major grocer has a mobile app. The CEO of Sears has offered to buy the company's real estate and its heralded Kenmore brand. Just for fun: images of Art Deco Sears buildings. Back when we built temples to retail. Twitter has banned security company Kaspersky Lab from advertising on its platform due to the company’s alleged ties to Russian intelligence organizations. What if Facebook charged a fee to use its service? Based on average revenue per user, Facebook might have to charge $11-$14 for monthly subscriptions to offset ad revenue, but it would empower users with choice and a sense of value. YouTube TV added its first digital-only networks with the launch of two channels from Cheddar: its financial news network and Cheddar Big News. Ads from over 300 companies and organizations — including tech giants, major retailers, newspapers and government agencies — ran on YouTube channels promoting extremists, including white nationalists, Nazis, pedophilia, conspiracy theories and North Korean propaganda. Now Snapchat advertisers will be able to include a button on their sponsored Lens that can carry out a number of actions, such as letting users visit a website, watch a promotional video, or install an app. Snap released seven new templates and Giphy integration for its Lens Studio, and now lets creators build their own face filters for the first time. Reddit now has more users than Twitter, and far more engagement. Flickr has been bought by SmugMug, which aims to restore the photo-sharing platform to its prominence. Yahoo bought Flickr in the mid-2000s, but never made much of it. Oath, Verizon's subsidiary decided to unload it for an undisclosed sum. Netflix added more than 7 million subscribers in Q1 of 2018, putting it around 125 million subscribers worldwide. According to an auditor, the future is bleak for MoviePass. Its parent company will sell 10.5 million shares at $2.75, 28.2% below last Wednesday's $3.83 closing price. Disney's streaming service is coming. With all of the content and franchises under their belt, Netflix should be scared. Radio's health is better than you think. But what's the long-term prognosis? The Podcast Consumer 2018, the latest in Edison’s annual study of the medium, contains all new data on podcast users in America, derived from the Infinite Dial 2018 study, The Smart Audio Report from NPR and Edison, and the latest from Edison’s Share of Ear® research. Google has a new podcasting strategy that completely reimagines how people find and listen to shows. Part one of an exclusive five-part series. Content creators can learn a lot about their craft by taking some lessons from podcasting. Program of the Week: Our pick this week is CMO Moves, a podcast that shares the human side of game-changing CMOs, hosted by Nadine Dietz. Do you have a program to recommend? Add yours to our Google Sheet: smonty.co/yourpodcasts. There are a number of businesses out there that are established for the sole purpose of creating fake businesses with fake reviews. A deeper look into the problem and what you can do about it from Brian Krebs. When it comes to Amazon, there's an underground community of reviewers on Facebook who game the system and flood the site with fake reviews. Peter Thiel’s data-mining company Palntir is using War on Terror tools to track American citizens. The software combs through disparate data sources — financial documents, airline reservations, cellphone records, social media postings — and searches for connections that human analysts might miss. It then presents the linkages in colorful, easy-to-interpret graphics that look like spider webs. Think Google and Facebook know a lot about you? Child's play next to Palantir. Surveillance firm Terrogence, a US government vendor, has been building a massive facial recognition database from photos on Facebook, YouTube, and other sites. Maybe on Flickr now? So what can you do to protect your online data? Practically nothing. Over 20 million Google Chrome users installed ad blocker extensions that contained malware. Lyft riders increased their tipping in 2017 by 8 percent over 2016. The company reported over $500 million in tips for drivers last year. Chalk it up not only to generosity, but to a well-designed app as well. UX matters. Want to measure your innovation efforts? These two intuitive measurements are how to go about it. Advertisers are still using last-touch over multi-touch attribution. Somewhat surprisingly, they also believe that's the most useful ordering. One of the keys to helping your business is understanding employee sentiment, which can now be accomplished with machine learning. The complete list of 2018 Pulitzer Prize winners. A lack of sleep alters a brain connection that causes fear and anxiety. As if you needed another reason to get more sleep? A grandfather's advice – or rather the way he lived his life – is a lesson on how to approach every single day. Solvitur ambulando: it is solved by walking. If you can master the art of a purposeful walk, you may be surprised at how much you can accomplish. These seemingly modern-sounding colloquialisms (such as ginormous, hipster, rap and more) actually have much earlier origins. In the next two weeks, the Brain+Trust team will be in Nashville and New York. Let us know if you'd like to get together in person. It's easy to throw shade at Facebook, AI and other technology, but the truth may be closer at hand; the four types of machine intelligence; ads are more intrusive now; B2B buyers care about the source of content; the best and worst companies at CX; how digital can help in-store purchases; the State of Digital Advertising 2018; Netflix dominates; Pandora commits to podcasts; why GDPR should matter to marketers; the data Facebook has on you (and won't give up); universal ad metrics across platforms; leadership challenges and digital transformation; the best GIF of 2017; and more in The Fault, Dear Brutus edition of The Full Monty from Brain+Trust Partners for the week of April 16, 2018. We've certainly learned quite a bit about Facebook over the last few weeks, haven't we? What's becoming increasingly clear with every conversation, every question answered (or skirted), and every discovery is that data privacy and ownership are at the center of things. And those issues remain critical for businesses to address with regard to their own customers. But more than that, we need to take a good hard look at the very technology that makes all of this possible. You know what else is powered by AI? Recommendation systems. They're behind Amazon's suggestions ("people who bought this also bought...") and they're behind the algorithms that control the content you see on Facebook. While they can save us time and bring us the content that (we think) we want, recommendation engines are perhaps the biggest threat to societal cohesion on the Internet – bubbles, conspiracy theories, and nonsense make their way to the top. And this mist of online reality threatens to break down the basic elements that hold us together as a society offline, as arguments and people alike become intractable. "Fake news" and "alternative facts" have crept into our collective vocabulary and some members of society are unable to discern truth from fiction. Elon Musk – that technological wunderkind known for embracing technology and all it has to offer – recently said "humans are underrated," noting that "excessive automation at Tesla was a mistake." And pioneers in areas of the Internet have begun apologizing for their creations. "The fault, dear Brutus, is not in our stars,But in ourselves, that we are underlings." But maybe – just maybe – the underlying factor isn't the algorithms that drive the platforms, nor even the platforms themselves. Perhaps our problem lies within. When freely available information meets confirmation bias meets positive feedback loops, the fact is clear: we cannot resist. The temptation to engage is too much. The sad truth about technology is deceptively simple: we're addicted. We need to obsess about the business of the AI buyer, and we need to obsess about their customers, too. These technologies need to fit the business, not the other way around. Otherwise, AI is a novelty without a clear path to profitability. Cognitive computing, AI, machine learning, and deep learning are often used to describe the same thing, when they actually differ. Here, explained, is what the differences are between four types of machine intelligence so you can better understand how the pieces fit together. European lawmakers, legal experts and manufacturers are already locked in a high-stakes debate about the legal status of robots: whether it’s these machines or human beings who should bear ultimate responsibility for their actions. As the Europeans seem to have jumped ahead in privacy concerns, we should closely watch where they net out with robot personhood. Ford Motor Company is preparing to launch its own self-driving car network, which should be "at scale" by 2021. In partnership with Getaround, Uber is launching a rental car service within its app. Uber Rent will initially launch in San Francisco and then most likely in the other nine markets in which Getaround is currently operating. The auto wars continue to get more complicated. WPP CEO Sir Martin Sorrell is stepping down after leading the ad behemoth for three decades. In 1985, he bought a controlling stake in Wire and Plastic Products, maker of shopping baskets, as a cash holding company, and grew it into the largest multinational PR and advertising company. In a survey of US internet users by Kantar Millward Brown, 71% of respondents said that ads are more intrusive now than they were three years ago. Most blog posts, videos, podcasts, and social media posts are underexploited and leave potential value on the table. Josh Spector has ideas on getting more value out of the content you already create. With half of B2B buyers saying they rely on more content to help them research prior to making purchase decisions, the source and trustworthiness of the content matters more than ever. The chief content officer is significant in non-media companies. These new content creators are engaging with consumers in a way that is distinct from that of the chief marketing officer or chief communications officer. What factors into a negative brand experience? It depends on who you ask. Brand professionals and consumers differ widely. 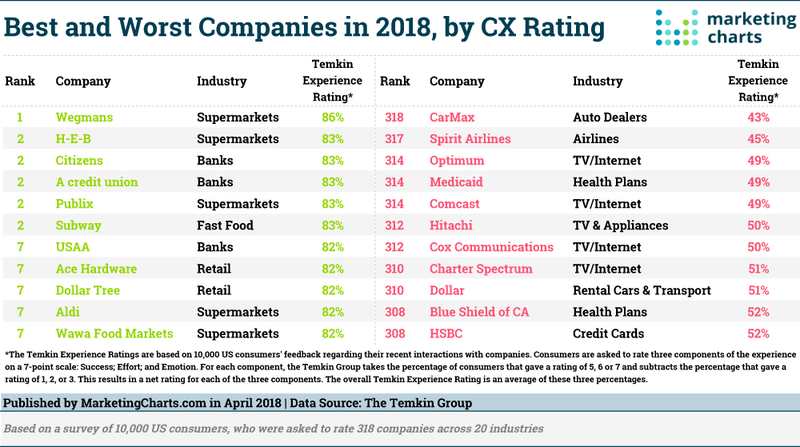 From the Temkin Group, here is the list of US brand with the best and worst customer experience ratings in 2018. Supermarkets and banks on one side; Internet providers, airlines and car dealers on the other. Online shopping is a mainstream activity—eMarketer forecasts roughly 70% of the US population will make a purchase digitally this year—but more buying journeys still end offline. Here's a look at how digital can help in-store purchases. Walmart is in talks to buy India's Flipkart, but because eBay owns a percentage of the company, Walmart may have to strike a deal with eBay first. This could be the deal that propels Walmart past Amazon in international markets. It could also lead to an interesting tie-up with eBay. Speaking of India, it's home to the best-performing retailer in the world, which you probably haven't heard of. Find out what makes it so successful. Walmart and Amazon are transforming grocery shopping, mostly by unlocking the missing piece in online food shopping: same-day delivery. An estimated two-thirds of tweeted links to popular websites are posted by automated accounts, not human beings, according to new research from Pew Research Center. How to use Twitter to make you smarter and find interesting people. We've probably all got Facebook exhaustion from the goings-on in the last month – and certainly from the past week. We'll just leave you with Mr. Zuckerberg Explains the Internet to Elderly Senators. Plus, there's more Facebook news in the Pʀɪᴠᴀᴄʏ/Rᴇɢᴜʟᴀᴛᴏʀʏ section below. A new Gmail is set to arrive in the weeks ahead, with a sleeker design, Smart Reply, the ability to snooze emails, and self-destructing emails that can neither be printed nor forwarded. Snap is testing a commerce feature allowing users to swipe on publishers' Discover channels to buy products from the Snap Store. China’s Sina Weibo will remove gay and violent content, including pictures, cartoons and text posts, during a three-month clean-up campaign. The encrypted messaging app Telegram must immediately be blocked in Russia, a Moscow court ruled Friday due to Telegram’s refusal to hand over the keys to its users’ conversations. We'll just leave this here. Forget fleeting video views; brands are trying to get repeat viewers who’ll watch by appointment. Netflix continues to dominate the US video streaming sector according to the latest forecast from eMarketer, with total viewership expected to grow by 3.6% this year to reach 132.6 million viewers. Edison Research, producer of the annual Infinite Dial report (shared in our March 12 edition) on digital media consumption, has released its Infinite Dial Canada 2018 report, its inaugural effort in the Great White North. Pandora is doubling down on podcasts, in an effort to grow its 75 million users through a more diversified catalog. Program of the Week: Our pick this week is Stay Tuned with Preet. Preet Bharara, former US Attorney who fought corruption, financial fraud and violent crime, hosts this plainspoken series about justice and fairness. Do you have a program to recommend? Add yours to our Google Sheet: smonty.co/yourpodcasts. If you download the data Facebook has on you, you might be surprised. It's more than just what you keyed in and the platform doesn't exactly allow you to completely obliterate everything about yourself. Bottom line: our lives are inextricably linked to the online world (not just Facebook). What Mark Zuckerberg didn't say about what Facebook knows about you is perhaps more important than what he did say. Some are calling his self-proclaimed innocence infuriating. Others call him out for simply lying about your data. Consumers would rather share their data directly with brands than give them to third-party platforms. All the more reason we counsel clients #ownyourdata at Brain+Trust Partners. Here's Brain+Trust Insights' Christopher Penn with a primer for what GDPR is and why it should matter to marketers. Brain+Trust Insights is our affiliated analytics group. There are upsides to GDPR: increasing cross-functional collaboration and accelerating data-driven innovation are among them. Does the United States need a Department of Cybersecurity? WeWork is buying Chinese coworking startup Naked Hub for $400 million as part of its international expansion. In case you wanted to keep track, here's a list of WeWork's acquisitions to date. NBCUniversal is rolling out a new advertising metric called CFlight, which will measure all advertising impressions across all of NBCU — whether those ads were consumed live, on-demand, on linear TV or digital platforms, according to Sara Fischer at Axios. ESPN has similarly rolled out its own standards to measure video viewership across platforms. ESPN says it will count linear and streaming audiences as the same. What's the difference between a data scientist and a data analyst? No, this isn't some nerd joke, but an important distinction as you think about the roles necessary to deal in data in the 21st century. As penance for giving you 10 endlessly fascinating websites to waste your time on last week, we'd like to grant you back some "little grey cells": 30 websites that will make you unbelievably smarter via Lolly Daskal. What's holding back companies from successful digital transformation? It's not the technology, nor is it the staff. The biggest threat and reason why most companies will fail to adjust and most likely either end up bankrupt, acquired, or marginalized is this: their leadership mindset. Since taxes are due in the United States this week, here's how a 27 year-old math whiz (and his Uber driver) found a big flaw in an IRS tax formula.